Drawing and coloring are no longer activities reserved just for children. Adults of all ages have recently begun immersing themselves in this long-forgotten pastime, rediscovering hours of creative fun and relaxation. You too can awaken your artistic flair by investing in supplies like colored supplies that will help you create beautiful and meaningful works of art. Choose the colored pencil set that is perfect for your drawing and coloring needs by learning what ones stand out as the best colored pencils among skilled and novice artists alike. The Prismacolor Premier soft core 132-count colored pencil set offers you dozens of different hues that help you unleash your creativity. These pencils feature thick yet soft cores that are perfect for shading and shadowing. They also are ultra-smooth so that you get an even layout of color each time you use them. The pencil lead itself is sturdy and resistant to cracks so that you can use them longer without having to sharpen them. They are light, easy to use, and designed to fit comfortably in your hand. They also are water soluble, allowing the color to come out of clothing and fabrics easily in case you accidentally mark yourself, a tablecloth, carpeting, or any other fabric at home or work. The major drawback with the Prismacolor Premier soft core 132-count colored pencil set lies with the somewhat delicate shafts around each pencil. People have reported that the shafts crack easily after repeated use. Likewise, users report that some of the colors in each set do not match well with other hues. The set is not color coordinated like other colored pencil sets. 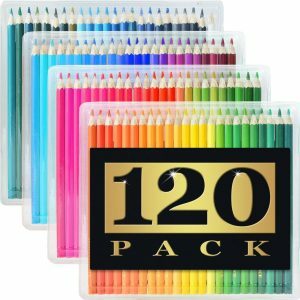 The final verdict of the Prismacolor Premier 132-count set is that it is ideal for people who are serious about their art hobby and want to use one of the best sets on the market. People on a limited budget, however, may find the price a bit steep. Crayola is a household name that is commonly associated with the finest of art and drawing supplies. This brand’s 50-count colored pencil set does not disappoint with its array of brightly colored pre-sharpened pencils. This set is well-suited for home and professional use and is priced affordably to fit any artist’s budget. The set is also made from reforested wood, which appeals to the environmentally conscientious who want to avoid using products that put a strain on the earth’s natural resources. The set is small enough to fit easily within a purse or book bag. It also features soft lead that is resistant to cracking and breaking. As with many Crayola products, the downside of this colored pencil set centers on the fact that it is housed in a flimsy cardboard box. The box offers little protection to the pencils if it gets stepped on, wet, or otherwise damaged. The pencils also tend to wear down quickly and need to be sharpened often. 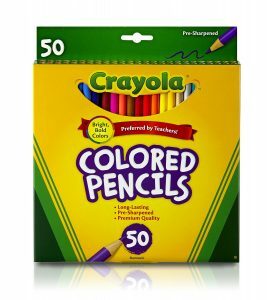 The final verdict for Crayola’s 50-count colored set is that it is ideal for burgeoning artists on a limited budget who want good quality colored pencils for recreational coloring and drawing. The limited range of colors and questionable lead quality may not be suited for a skilled artist, however. 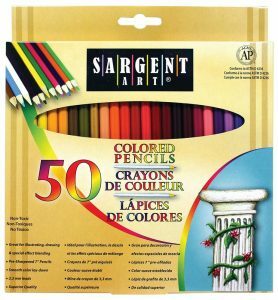 Sargent Art premium 50-count colored pencils are an online best seller because of their price, wide range of colors, and exceptional quality. This set features 3.3. millimeter thick lead and 50 different shades of hues to let you create the perfect work of art each time. The set is also AP certified, setting it apart from its major competition from brands like Crayola. The pre-sharpened pencils are seven inches in length and designed for easy and comfortable coloring, drawing, and shading. The major drawback with the Sargent Art 50-count colored pencil set is waxy coat that covers the lead itself. People who have used the set that the wax film on the lead leaves residue on the coloring page and makes the pencils more like crayons than drawing pencils. People also have said that the colors are actually quite dull on the paper and lack the vibrancy and shine found with other brands. The final verdict the Sargent Art 50-count colored pencil set is that it may be a great starter set for children or for novice artists. However, its poorer quality lead may be ill-suited for people who are serious about their art hobby or artists looking for better quality drawing utensils. 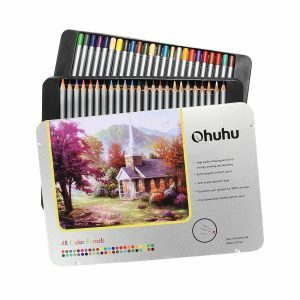 The Ohuhu 48-count drawing and colored pencils are some of the best colored pencils for people who are fans of the adult coloring book craze. These pencils feature fine points that are ideal for coloring inside the intricate lines and swirls found in adult coloring books today. The set also comes housed in a whimsical yet practical circular carrying container that lets you pack the set easily into your book bag or purse. The pencils come pre-sharpened while the set itself has 50 different colors from which to choose each time you use it. The drawback of the Ohuhu 48-count drawing and colored pencil set is the flimsy quality of lead. The lead breaks and wears down easily, forcing you to have to sharpen them often. This constant sharpening means that the set itself does not last for very long before you have to buy a new one. The set is also not ideal for children because of how slender the pencils are. They present a choking hazard to children under the age of 3. The final verdict for the Ohuhu 48-count colored pencil set is that it is a good starter set for older children or adults who are looking for an easy-to-use and inexpensive set. However, serious artists and people who have small children in the home may consider another brand of colored pencils. 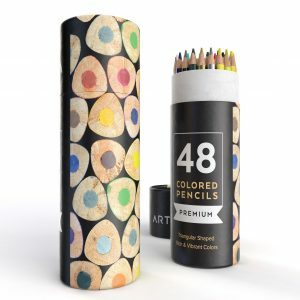 Everyday Essentials is a unique colored pencil set in that it comes with its own canvas pouch pen bag and also a two warranty that guards against manufacturer’s defects and damages. This set features a rich variety of soft core colored pencils that are perfect for drawing, writing, shading, shadowing, and sketching. The pencils likewise come with durable shafts that resist cracking and breaking while you use them. Another unique features of this set is that the pencils are individually numbered so that you can identify and select them easily. You no longer have to search for the right color name in your set or choose a color at random without knowing if the hue will match the colors already on the page. This set is designed to make coloring more fun and relaxing. The drawback of the Everyday Essentials 72-count colored pencil set is that it is not pre-sharpened. You must sharpen each pencil when you get the set or sharpen the pencils as you use them. The pencil bag is also made out of mediocre quality canvas. Some users have noted that the pencil bag smells like chemicals when they first purchased their sets. The final verdict of the Everyday Essentials 72-count colored pencil set is that it is ideal for people who like the convenience of a carrying case and numbering for faster pencil selection. The set may not be suited for children or for novice artists who are shopping for a pencil set on a budget. The Artist’s Choice 120-count colored pencil set gets its name from the fact that it was designed by artists for artists of all skill levels. 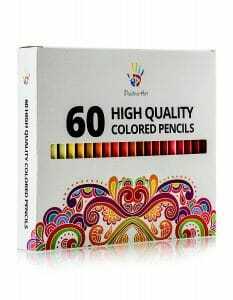 This set comes with 120 different richly colored pencils that are created for easy use and a comfortable fit in your hand. The set also comes in its own collapsible case so you can take it anywhere with you easily. The set is backed by a limited manufacturer’s warranty that gives you 100 percent guaranteed satisfaction. You can use this set for at-home artistic projects or for coloring in adult coloring books. You can also take it to work for projects and presentations. The drawback of the Artist’s Choice 120-count colored pencil set falls with its questionable lead quality. People have noted that the pencils break easily and need to be sharpened often. Further, the pencils are not numbered or named. This lack of identification puts a bit more guesswork into artistic activities that should be fun and relaxing. The final verdict for the Artist’s Choice 120-count colored pencil set is that it is well-suited for serious artists who like the convenience and availability of a wide variety of colors for their projects. This set may not be ideal for children or for people looking for an affordable starter colored pencil set. Positive Art’s 60-count colored pencil set is perfect for coloring as well as drawing, writing, sketching, and other crafts. This set comes with a range of vibrant colors. The pencils themselves feature thick 3.3 millimeter lead that is resistant to cracking and breaking. The Positive Art colored pencil set also features fade-resistant technology that keeps the colors bright and rich on your page for longer. This set is ideal for both children and adults and comes at a price that many find easy to fit in their budgets. The drawback of the Positive Art 60-count colored pencil set is the fact that it comes in a cardboard box that offers little protection to the pencils. You must transfer the pencils to a carrying case or storage box if you want to keep intact and dry. Some users have noted as well that the colors are not as vibrant as they appear in the box. The final verdict for the Positive Art 60-count colored pencil set is that it is great for people who like their pencils to have thicker lead. However, the set may not be ideal for people who like a variety of darker colors or individuals who want their sets to be housed in sturdy carrying cases. The Arteza 48-count colored pencil set is an Amazon Editor’s Choice for its innovative and eco-friendly design as well as its affordable price and wide variety of colors. The set comes with its own environmentally friendly carrying case that is made out of cardboard. The pencils themselves are made out of lightweight and durable basswood so they are easy to use and comfortable to handle. The unique factor about these pencils is that they are triangular shaped, making them ideal for children to color with at home or in school. The triangular shape allows for an even application of color and encourages proper pencil grip while you use them. The major drawback with the Arteza 48-count colored pencil set centers on the lackluster colors left on the page. The pencils have such soft lead that their colors are muted and sometimes difficult to see on the coloring page. People also find the pencils difficult to sharpen because of their triangular shape. The final verdict for the Arteza 48-count colored pencil set is that it is perfect for children or for novices looking for a good starter set. The pencils are easy for kids to use. However, serious artists or people who prefer an easier and more convenient set of pencils may find this particular set more trouble than it is worth. 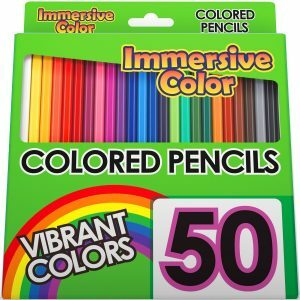 The Immersive 50-count colored pencil set comes at a low price that puts it on the same level as sets offered by better known brands like Crayola. This set feature pencils that have soft lead and strong cores, allowing for prolonged use and an even application of color. The set also lacks duplicate colors, meaning that each pencil is unique. The set is designed for children as well as adults who have become fans of the adult coloring book craze. The major drawback with the Immersive 50-count colored pencil set is its lack of a carrying case. The pencils come in a cardboard box that is easily damaged if stepped on or exposed to water. The pencils are also not pre-sharpened, requiring you to sharpen them before use. The final verdict for the Immersive 50-count colored pencil set is that it is better suited for children than serious artists or adults who prefer stronger and longer lasting pencils. It is a good starter set for the price and range of colors, however. 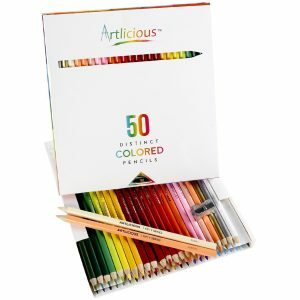 The Artilicious Premium 50-count colored pencil set is another Amazon Best Seller for its price and quality. This set comes with 50 vibrantly colored pencils that are unique unto themselves. The set does not have duplicate colors in it. The set also is made from non-rain forest harvested wood that is eco-friendly and durable. The thick leads on the pencils resists cracking and splitting, allowing them to last longer. The major drawback for the set, however, centers on its lack of a carrying case and its lack of vibrant color when applied to the page. People note that the pencils are not ideal for darker hued coloring but rather leave behind faint colors on the page. The pencil set also tends to be more basic in its color selection than other sets. The final verdict for the Artilicious 50-count colored pencil set is that it is ideal for children or people looking for a higher quality starter set. 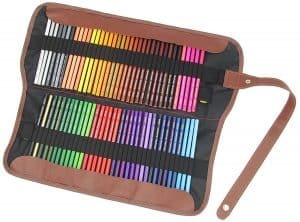 This set may not be ideal, however, for people who prefer bolder colors or those who want a durable carrying case when ordering their pencil set. Aside from the online colored pencil reviews available online, you may wonder what other criteria to keep in mind when shopping for one of these sets. You can find a set that matches your artistic needs by remembering these important factors. Starter sets: Starter sets typically contain fewer than 50 pencils and are lower in price. They also are typically housed in cardboard boxes rather than complementary sturdy carrying cases. Professional sets: Professional sets are designed for serious artists and art students. These sets may contain upwards of 100 or more different colors and pencils. They also tend to be higher in price. Pre-sharpened sets: Pre-sharpened sets are popular because you can use them straight out of the box. Some of these sets also have their own sharpeners for convenient use. Ergonomic sets: Ergonomic sets are popular with people who may suffer from arthritis or people who want to teach their children proper pencil grip. These pencils are often triangular shaped and apply a flatter color to the page when you use them. These four examples are the most common pencil set types available today. They also are designed for easy use and enhancement of your artistic enjoyment. 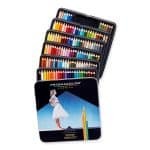 Colored pencils sets also come in a variety of price ranges. As noted, professional sets typically are more expensive than those made for children or for novice artists. However, some of the lower priced starter sets are on par with the quality and application of professional sets. The higher price tag does not guarantee better quality in many cases. It only means that the set contains more colors and pencils. The softness of the lead is another factor to think about when shopping for a colored pencil set. Softer lead pencils often need more frequent sharpening. The softer lead is typically ideal for sketching, shading, and shadowing rather than applying darker hues. Harder leads, on the other hand, can be used for multiple uses including writing and drawing outlines. Harder lead sets most often do not come pre-sharpened. You also may need to buy a separate sharpener designed for harder pencil lead. Finally, when shopping for a colored pencil set, you may think about how many pencils you actually want and need for your artistic endeavors. You can find sets that contain dozens or even hundreds of pencils. Likewise, you can find sets that contain just a dozen or fewer pencils. Before you shop, you may think about how many colored pencils you actually need. This decision helps you find a set that will give you your money’s worth when it comes to use. These criteria play a role in finding the ideal colored pencil set. Based on these details and the colored pencil reviews, you can find a set that matches your artistic needs and budget.